Side by Side is our capital campaign to pay off the mortgage on our building. In 2014, the VNC Leadership Team made the decision to raise all of the money needed for our mortgage for the year in one month. We believe by raising the funds at one time, it frees up more money for ministry. This year, we are doing it again, and we need your help to make it happen! We may not be in the same situation as Nehemiah; however, we are in this together. If the whole VNC Tribe combines our resources, Side by Side, and does what God has asked us to do, we have nothing to fear! • As illustrated in the graphic below, we are collecting pledges at five different levels. 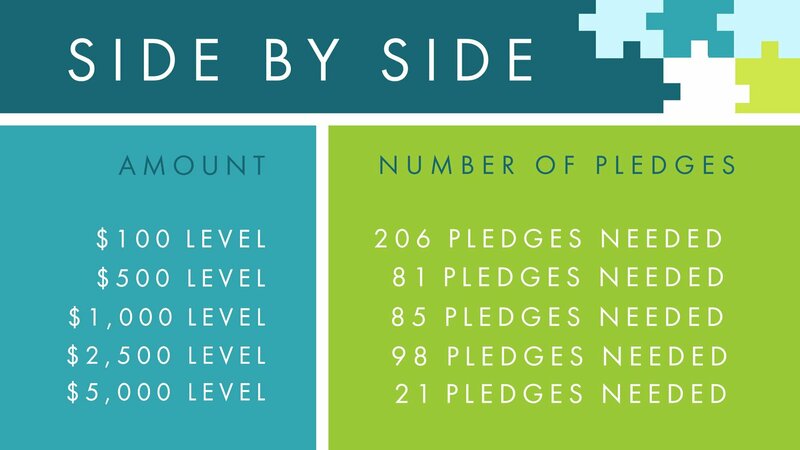 • If we collect all the pledges at each level, we’ll have a total of $550,000. • This will cover our entire mortgage for the year ($465,000). • Everything collected above the mortgage will be used on the principal. • Pledges will be collected during the month of March. • Pray and listen to what God is asking you to do. • Surrender to being obedient and obey the direction that is given to you. • Select contribution number and fill out our online pledge form. • If you are unable to pledge one of the exact amounts on the pledge form, you can enter your pledge under "Other Amount." How can I personally make this financially feasible? • Think about using some or all of your year-end bonus. • Use some or all of your tax return. • The amount you can commit to is not as important as your participation.